Coya Dubai ... bringing Peru’s colours. 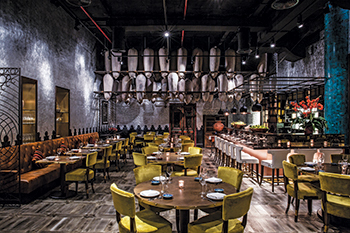 The new Coya Dubai, which opened its doors earlier this year, has carved a niche of Latin America in the UAE, bringing in the colour, décor, texture and vibrancy of Peru to the restaurant village at the Four Seasons Resort Dubai located on the Jumeirah Beach Road. The design and planning process for the 8,500-sq-ft outlet started at the end of 2013 and the work was completed at the end of last year. 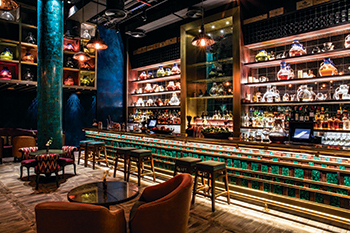 Created by London-based designer Sagrada, Coya Dubai has fused both industrial and colonial Latin American style with a touch of Inca. This unique and refreshing setting is perfectly complemented by modern metallic and gold finishes providing a contemporary edge to the Peruvian elegance. To ensure that the early design work was well founded, the experienced Sagrada designers accompanied the team and travelled to Peru in search of inspiration. Materials were sourced for various suppliers. 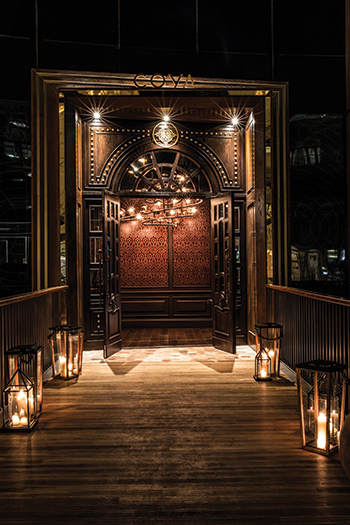 These have been brought over from Coya London to transform Coya Dubai. A spokesperson for Sagrada elaborates: “We wanted to bring some of the colour and texture that we saw in Peru to the restaurant design. In Peru, we sourced many pieces of furniture, doors, art and pottery during our visit and have used them to accessorise the interior spaces. The metal screens were inspired by the balconies we saw in Lima. “A lot of detailing went into this fast-paced project. All the furniture was commissioned for Coya using sumptuous fabrics and leathers. The banquettes are deep buttoned with antiqued leather that is intended to patinate further over time. Commenting on the colour scheme, the spokesperson says: “Coya has a mixed tapestry of finishes. The scheme is rich and warm. We wanted it to reflect the fun character of the restaurant and for it to feel as if it had always been there. There are hand-finished walls by specialists with the inclusion of gold and silver leaf to add warmth and a touch of glamour. The bar is in a rich blue that was inspired by the brightly coloured buildings in South America. Timber and metal in various finishes, from polished to antique, highlight features throughout the scheme. “Metal and timber are the key ingredients, but are used in various states and finishes – from rusty metal screens to precious stone malachite on the bar front; and from patterned resin wall panels in the reception to distressed paint work in the bar. Sumptuous fabrics and original textiles have been used for cushions,” he says. Other features include columns, clad in distressed copper panels and antique mirror, behind the bar. Gold and brass is a thread that runs throughout the whole scheme. Many materials are used to create the Coya look, and work with the lighting scheme. Coya’s furniture has been hand-selected: from the crushed, velvet-textured chairs to the valuable, historic art, everything in the restaurant defines Coya’s DNA which is now widely recognised across its three outlets. The materials for the project came from a wide network of suppliers. A lot were custom-made for the project by craftsmen rather than purchased off the shelf. The timber floor came from Italy; the reclaimed terracotta tiles from France; the turtle marble in the wine corridor was ordered especially by a local stone merchant; and the decorative metal screens were all made locally in Dubai. “The contractor made all the joinery elements in its workshops. The hand-painted and embossed leather bar front came from one of our contacts in London,” says the spokesperson. One of the challenges from the start was to convey the feel of the various custom wall finishes to the team that was to undertake the work, according to the spokesperson. “We produced large samples which were matched to and developed from. We also visited the site during the construct phase to ensure the look was as intended,” he says. The spokesman continues: “The space is long, with curved outer walls. This posed a challenge when we came to plan the layout and entrance. We always felt the entrance was in the wrong space and did not do the venue justice. “The solution that we proposed was a bridge that linked directly from the valet to new grander entrance doors. This also allowed us to move the flow from reception to the other spaces. The journey to Coya also now starts from the outside as you make the walk across the bridge,” he concludes. Sagrade is a highly creative London-based interior design studio. The firm says it believes in producing design solutions that are innovative and practical whilst ensuring they meet the client’s brief. Sagrada works across the globe, including in Europe, the US and the Middle East and it has secured most of its projects through word of mouth and repeat business. Other projects designed by the firm include La Petite Maison in Dubai and The Arts Club in London. It is currently completing the Coya Miami. 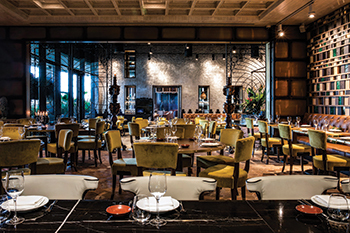 Key players on the Coya Dubai project include Sagrada led by Richard Saunders for interior design; AMBB as the main contractor; and Delta Lighting, which supplied the majority of light fittings.